Choose your inspiration. Whether it is a great vintage baseball mitt, a piece of art that was in your mothers room when she was a baby or a grouping of colors that you have always loved together, come up with something to get you motivated & to start building upon. Set your budget. By no means do you have to break the bank to create a dream nursery. Choosing double duty furniture such as a changer/dresser is a great place to save space and cash! To theme or not to theme! Themes can easily be overdone. This is the perfect example of when less is more! Vintage cowboy, classic nursery rhymes & shabby chic florals are all fantastic options when done correctly. Bedding is a great way to accent wall art or to introduce your nursery theme. Choose your paint colors according to your inspiration & fabric choices. A chair rail is an inexpensive way to bring a great custom touch to your nursery. It allows you to bring in multiple colors tastefully. Once the room is painted, get the furniture and bedding in and start accessorizing! IMPORTANT TIP! Order furniture early. If anything takes a while, it will be your furniture! 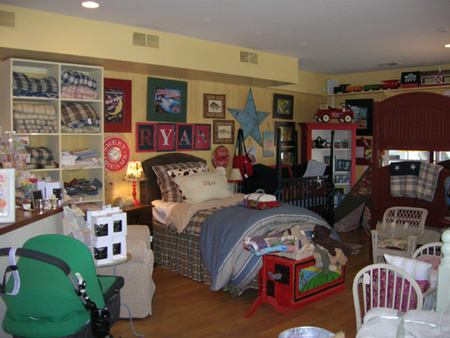 A crib, changer/dresser & nursery glider are the essentials if room permits. This Belly Scoop was written by Shannon McKernan, owner of BabyCakes and The Little Red Barn and someone who has Fabulous Taste! Visit www.babycakesLA.com for a fun selection of bedding fabrics and 4 piece custom sets starting at $265! For updates of new products on the market, upcoming trends and helpful decorating tips, keep your eyes posted on more informative Belly Scoops to come by Shannon!